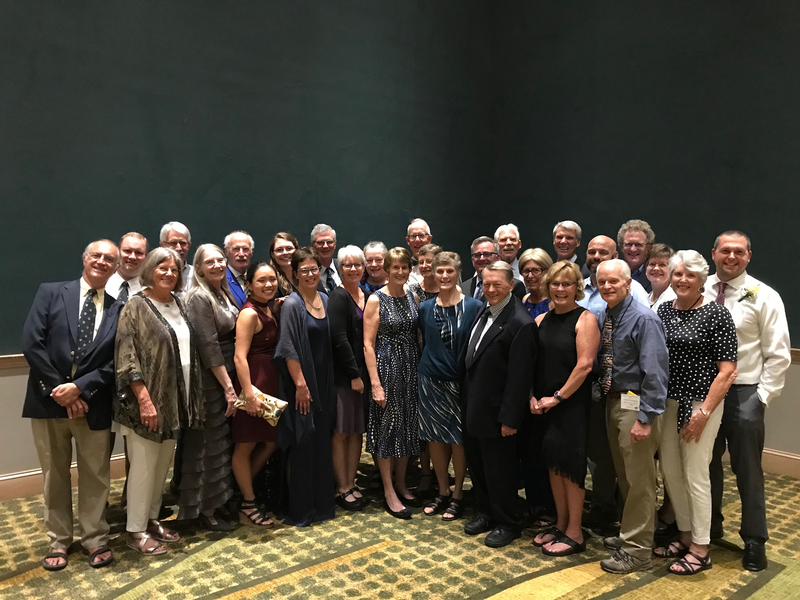 Last month, nine Oregon LMSC volunteers attended the 40th United States Aquatic Sports Convention in Jacksonville, Florida.The Annual USAS Convention is represented by the five National Governing Bodies: USA Swimming, US Masters Swimming, USA Water Polo, USA Synchro, and USA Diving. These five NGBs come together to update rules, legislation, workshops, and finances. Several of our OMS Board members are on National Committees: Bob Bruce, Open Water Committee Chair; MJ Caswell, Top Ten Committee; Barry Fasbender, Championship, Recognition and Awards Committees; Christina Fox, Rules Committee; Sandi Rousseau, Championship Committee; Matt Miller, Long Distance Committee; Ginger Pierson, Recognition and Awards Committee; Tim Waud, Coaches Committee; and Nancy Vincent, Oregon Club Vice-President attending her first USAS Convention. Representatives at USAS from the NW Zone. left and Matt is on the far right; the rest of the group are concentrated together near the center in the first two rows. Matt Miller was nominated and won the NW Zone At-Large-Director position which puts him on the USMS Board of Directors. Congratulations Matt! 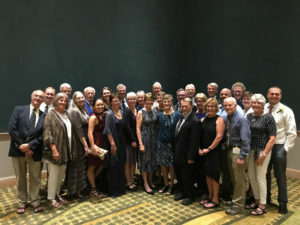 Willard “Wink” Lamb was honored at the International Swimming Hall of Fame Induction Ceremony as one of “Swimming World’s Twelve World Masters Swimmers of the Year”at the USAS Convention. Willard and his son Doug made the trip to Jacksonville and enjoyed attending a House of Delegates meeting and visiting with Masters swimmers from around the United States. Walt Reid from Pacific Northwest Association, was inducted into the IMSHOF Hall of Fame for his service to FINA and US Masters Swimming. April Cheadle from PNA and Bainbridge Island Masters, was awarded the “2018 US Masters Swimming Coach of the Year.”Congratulations to Willard, Walt, and April! Oregon Masters will be hosting the 2019 Ultra-Marathon Open Water National Championship on July 7, 2019. This will be the second year in a row that the Portland Bridge Swim will play host to an USMS OW National Championship. Congratulations Marisa! The 2019 US Masters Swimming National Championships will be: Spring Nationals April 25-28, in Mesa, Arizona, and Summer Nationals August 7-11, in Mission Viejo, California. The 18th FINA World Masters Championship will be held August 5-18, 2019, in Gwanju, South Korea. US Masters Swimming will be celebrating 50 years at the 2020 Spring National Championship being held in San Antonio, Texas, April 23-26, 2018. The 2020 Summer National Championship will be held in Richmond, Virginia, August 13-16. As we look forward to the 2019 season we are busy planning the pool and swim clinic schedule. If you are interested in hosting a swim meet or hosting a swim clinic, please contact: timpwaud@gmail.com. We are always looking for new facilities in which we can host pool competitions and swim clinics.